Stuff Points: Earn 64 points when you buy this stuff. A stack of rounded stones appears to be freshly piled. The towering collection comes together to form three tiers for water to flow. Each level has a lighted pool that's illuminated by a bright LED light submerged in the water. The included pump will bring water up to the top of the fountain where it will pour out to cascade down the pile of rocks. The first stop on it's journey is the upper pool. As water trickles down, the pool will fill until the stream begins to flow out the side, and down to the next tier. The stream will shine and sparkle as it's lit up while filling the next section, and then a little waterfall will complete the journey down to the lower basin. It will then continuously cycle to create an endless scene that will add ambiance and set the mood. It looks like real river rocks were used to make this product, but it's actually a lightweight resin. The durable material is intricately detailed so it looks just like the real thing. High quality electronics will ensure proper function, and a one year warranty will give you piece of mind. 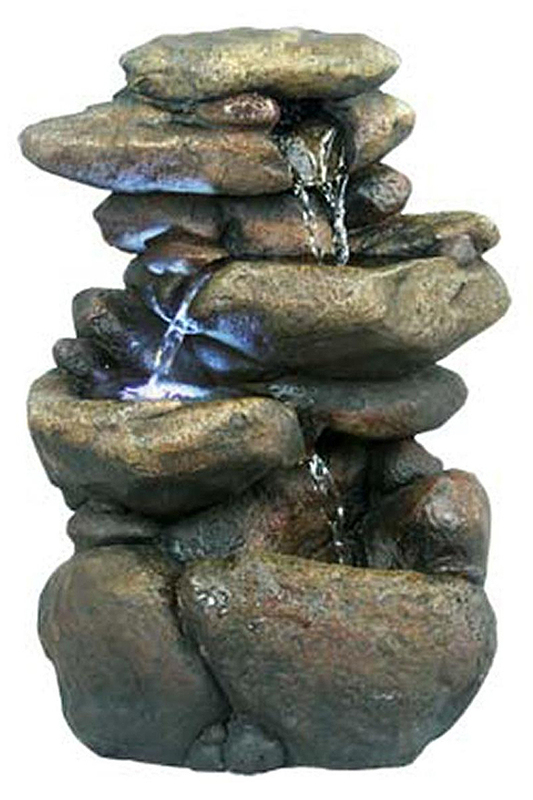 Enhance any location with this table top fountain, and feel like you are out at the creek, or down by the river, all day long. Simple Set-Up. Includes all parts, and comes mostly assembled with easy instructions. Integrated Lighting. Underwater LED bulbs improve the effect by illuminating water and enhancing details. Realistic Look. Fiberglass resin construction looks like real rocks and wood. High Quality. Intricate details makes it look better than others, and top quality electronics ensure proper function and long lasting performance. Inside or Out. Intended for table top placement, but durable enough for indoor or outdoor use. This model is 11 inches tall, and 7 inches wide on it's longest side. Bring the rustic look of a river into your home, or enhance outdoor spaces with this natural looking water feature. Get the look of real rocks without the high cost or heavy weight. Order Yours Today! How long to deliver this item? Average delivery time for this item is 4-5 days. 2 Stands Included! Floor or Tabletop Fountain with Iron Base.